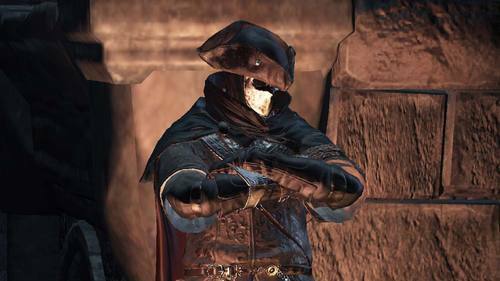 Ringfinger Leonhardt is a masked man who is first seen at Firelink Shrine, leaning against the empty throne of Prince Lothric. He wears the Silver Mask to cover his face, which was badly burned when he was a child. Despite being born into royalty, these burns prompted Leonhard to seek Rosaria, Mother of Rebirth so that he could be reborn and healed, but even after becoming a Finger of Rosaria, he changed his mind and instead served her as a knight. 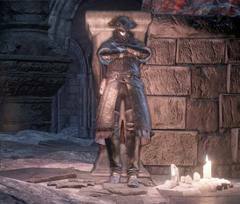 Leonhard eventually kills Rosaria and takes her soul to Gwynevere's chamber in Anor Londo, where he can be invaded by the player using a Black Eye Orb. Upon invading Leonhard, it is learned that he took Rosaria's soul in order to protect it for unknown reasons. Because Rosaria's soul can be transposed into Bountiful Sunlight - a miracle deeply associated with Gwynevere - it is speculated that Rosaria is Gwynevere (The Queen of Lothric) reborn, and that Leonhard attempted to restore her by taking her soul back to Anor Londo. It is noteworthy that Leonhard and items associated with Leonhard are the only sources of Rosaria being referred to as a goddess in the game.